C-VOL By AllMax Nutrition at SameDaySupplements.com® for lowest price. 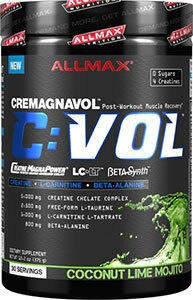 Allmax C-VOL is set to become your new post-workout ritual! Allmax C-VOL has been formulated with 5 g of 4 types of Creatine, 2.5 g L-Taurine, 1 g L-Carnitine L-Tartrate, 800 mg Beta-Alanine and 800 mg Betaine; a rock-star list of the “go-to” ingredients, dosed at effective levels for rapid recovery from intense training. CVOL™ fits your workout. It’s absolutely delicious, 100% sugar-free with next to no carbs. Want to build your gains faster than you ever thought possible? 1. Creatine-Magnesium Chelate: Patented, ionically-bound and highly-stable. 2. Creatine Monohydrate: The most studied, most proven of all forms of Creatine. 3. Creatine HCl: Over 50x more soluble than typical Creatine. 4. Creatine Base: The purest of all forms of Creatine – Also known as Free-Form Creatine it delivers the most Creatine gram for gram. The Creatine Absorption Complex in Allmax C-VOL has a specific effect on the threshold of cellular nutrient uptake; simply stated, it makes it easier. Creatine has a well-known cellular absorption issue. While Creatine does not have an issue getting into the blood stream when taken orally, it can have an issue with the absorption into the cells. 100% CLEAN LABEL PROTOCOL: With ALLMAX products, you know what you’re getting. We don’t hide behind proprietary blends. Every ingredient is individually listed with a precise mg measurement. The Clean Label Protocol holds us to a higher standard. You can be sure you are getting the highest quality. **Beware of other Creatine formulas that do not disclose the amount of each Creatine. Our #1 source is true, Creatine-Magnesium Chelate. This is a very expensive form and if included in other formulas, it is often the lowest inclusion. We have our CLEAN LABEL PROTOCOL. We disclose each and every ingredient amount so you know how good the quality of our formula is. What's In AllMax Nutrition C-VOL? Workout Days: Take 1 serving of Allmax C-VOL (12.5g) with 8 to 10 oz of cold water after your Workout. Non-Workout Days: Allmax C-VOL has a cumulative effect and should be taken in the AM. Allmax C-VOL stacks well with HVOL, CARBION, and MUSCLEPRIME. Produced in a facility that also handles Milk, Soy, Egg, Peanut, Tree Nut, Fish and Shellfish products. We have a large selection of in-stock AllMax Nutrition products including Creatine items and others for the lowest prices at SameDaySupplements.com® It's always easy to shop for C-VOL By AllMax Nutrition at SameDaySupplements.com® because you can browse by reviews, brand, prices or search for specific ingredients using our search tool. In-stock orders placed before 3pm EST ship out the same day to USA, Brazil, United Kingdom, Canada, Germany, Australia, Japan, India, France and worldwide at the cheapest prices online.